Tippy Top-Fantastic Mountain Views,Hot Tub, Privacy, SPECIALS BOOK FOR 2019 NOW! TIPPY TOP is a Gorgeous tri level (3), 6 bedroom with 2 bedrooms on each level, 4 King Bedrooms, 1 Queen Bedroom, 1 - 4 Bunk Bed Room)4 bath 3600 sq. ft. Custom Built true log cabin located in Shagbark a guard gated community approx. 6 miles from the parkway at light #3 in Pigeon Forge. The views from the cabin is spectacular hence the name of the cabin, the lot that Tippy Top sits on is 3 acres on top of a ridge by itself giving you great privacy with the benefit of being able to walk around the cabin without the fear of steep drop offs, allowing the kids and the entire family to walk around the cabin. 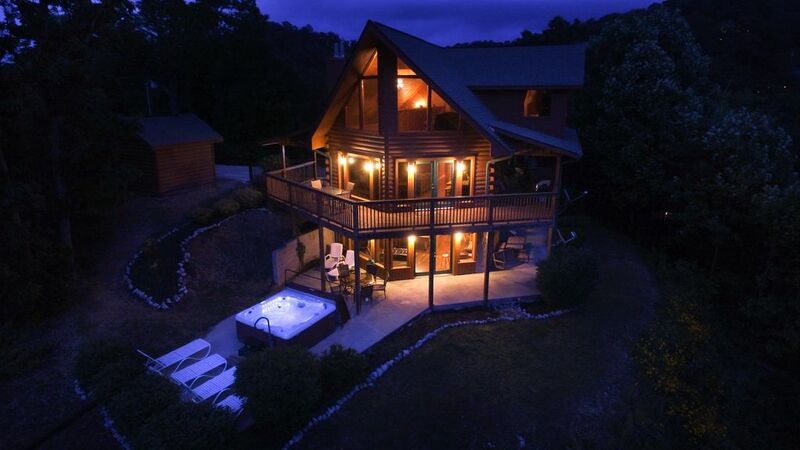 The hot tub sits out on behind cabin facing the mountains with heavenly mountain views. For those cooler nights there is 2 gas fireplaces one on the main great room level and one on the game room level. The cabin has 4 master king suites bedrooms with bathrooms on the 3rd level, there is a spectacular king bedroom with a wall of windows surrounding a large Jacuzzi tub with spectacular mountain views with fireplace for those cooler romantic evenings. The kitchen and dining area is fully equipped from dishes to glassware, pots and pans, with all the small appliances that make it a great kitchen to cook in. If gas grilling is your choice enjoy the view as you prepare the family meal after a full day of visiting all the sights in Pigeon Forge and the Gatlinburg Smoky Mountain National Park area. For the larger groups there is plenty of parking for up to 6 vehicles. If you have any further questions or would like to reserve the dates. "Remember Not All Cabins Are Created Equal"
We had TIPPY TOP built in 2007 in Shagbark, We chose Shagbark because of its Park like setting and the shear beauty of the lot that Tippy Top is built on It's views are spectacular and the cabin is very comfortable from the smallest to the largest groups. Tippy Top is located in Shagbark Resort. Shagbark ihas a setting like the Smoky Mountain National Park.. The cabin has more than true dishes and utensils for your entire group. 1 65" flat screen with speaker mounted above fireplace in family/ theatre area, 1 55" Samsung flat screen in game room, 6 t.v in bedrooms all with satellite and N.F.L Sunday ticket. (5) 1 65" Flat screen above fireplaces in Family / Theatre Room, 1 55" Samsung Flat Screen in Game Room, 6 T.V's in Bedrooms all with Satelite. This cabin was perfect!! It's far enough away from town to enjoy the beautiful mountains and close enough to town for all the action. The cabin was well stocked with all the necessary kitchen supplies, towels, and bedding. We would definitely stay here again. The cabin is situated high on a mountain which I loved! The views were spectacular and the wildlife was plentiful! Very easy trek into Pigeon Forge and Gatlinburg. The rooms in the cabin are very big, with the exception of the kitchen but it is very well equipped and all you need for vacation. The owner communicates with you well and is very accommodating. I recommend this for a wonderful family vacation spot! Cabin was very nice and well appointed. Owner is very accommodating. We ran into a plumbing issue that the owner went out of his was to resolve and ensure there was minimal impact to our stay. Owner gets high marks. Cleaning crew was great. Only one item to improve upon. The outside was not as well kept as inside. Some visible trash and old household items laying around the yard. If outside was as well kept as inside, I would have giving a 5 star rating. I would stay again and I would rent from this owner again. Tippy Top was beautiful! The area is just wonderful! Its worth the little scary ride up the mountain!! Our trip got cut short due to a death in the family so we plan to come back again later! Tippy Top definitely accomadated our family of 13. The beds and the hot tub felt so good after a day of hiking, rafting and tubing! The game room was enjoyed by everyone. The drive up to the cabin was a little nerve racking for some of us though, lol, but the view was so worth it! We were even greeted by a bear while emptying the cars out upon arrival! Our only complaint was the kitchen was a little small for the size of the house but, we were still able to cook just fine. The housekeeping upon arrival could have been better. Mark was great to work with and replied with in a timely manner with all questions. Would definitely recommend Tippy Top! Cancellation Policy: ALL Cancellations made receive credit in the form of an Inventory Reservation Certificate, less a $50 administrative fee. The certificate is good for one year from the scheduled arrival date and can only be used for the cabin originally reserved. Cancellations made 30 days or less in advance of a holiday or peak season reservation will receive credit in the form of an Inventory Reservation Certificate, less a $100 administrative fee. Changes in arrival dates are allowed subject to availability, more than 14 days in advance of the scheduled arrival date. There is a $25 administrative fee for all cancellations or changes. No changes are allowed within 14 days of your arrival.